Love bags? Swoon patterns is giving away their first ever pattern, the Ethel Tote for free! The Barbara Dress is a pretty retro style design that’s a snap to sew. Enroll in Craftsy’s free mini class and learn some Bag-Making Basics and make a reversible tote and zippered bag in the process! Vintage style headbands are the perfect way to use up scraps and look great wearing it. Be entered to win 20 fat quarters just by uploading a recent project to Instagram and tagging @stitchcraftcreate. Whether it’s for a birthday or just pretend play, these crowns are perfect for boys or girls. Stack your baskets when you’re not filling them with goodies with a Matryoshka Bin tutorial. If you are looking for quiet activities to keep you child busy, look no further than these Eye Spy Bags (shameless plug)! Need little trinkets to fill them? I just saw that Tiny Things Are Cute has just restocked their Jar O Loot (there’s plenty inside these jars to make several eye spy bags or one GIANT one)! Celebrate Shark Week by creating a fitting pencil case. Be back to school ready and sew up a fun t-shirt ruffle skirt. This cactus isn’t just a fun decorative piece, it can serve as a pincushion too! Looking for something a bit more functional? Try this wrist style version instead. This entry was posted in General on August 14, 2014 by stacy. 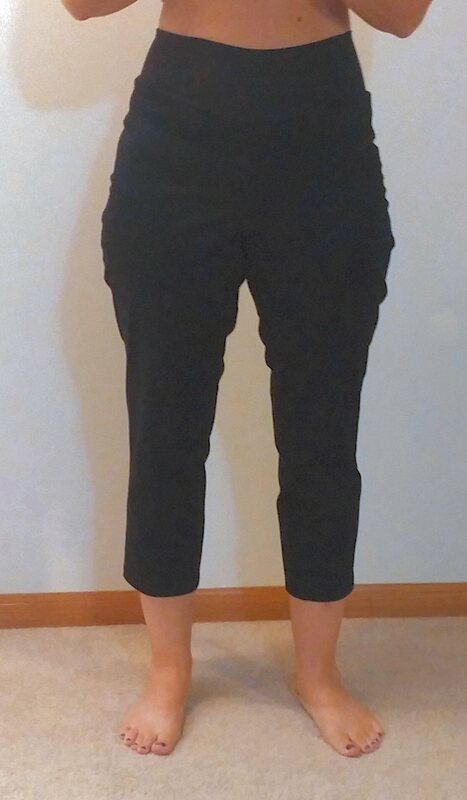 Several weeks ago I made a pair of skinny legged trousers that I lovingly named “Cheater Pants” because they were so ridiculously easy to make. While the fit was pretty good after several tweaks, I thought there was still some room for improvement (mostly the fit in the lower seat, maybe a slightly different crotch curve?)…. or that I needed to try using a different material with this pattern. Good thing I didn’t make any modifications before moving on to my next pair because these are absolutely perfect! The change in material (a bit stiffer, less stretch sateen twill) seems to make a difference in the way this pair fits and I have to admit, they look darn good. 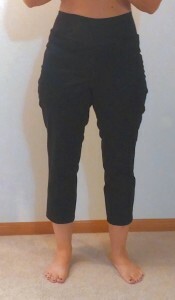 I also opted to use the ‘regular size’ waistband with this version and although I’m not a fan as to where it sits on me (above the belly button), they would be a great option if you were looking for some tummy control (think very firm spandex, but not quite powermesh) with your capris. *Note to self: Press those side seams better, they look horrible in this photo! This entry was posted in General on August 13, 2014 by stacy. One of the items on my youngest’s school supply list was ear buds (for computer lab). After unwrapping them out of their package, he immediately starts playing with them, swinging them around and, in general, making them a tangled mess – I could foresee bad things happening to these ear buds before the school year is over. In an effort to keep them clean (because I imagine they will be put into some sort of ‘cubby’ system with the rest of his supplies), easier to find, and less tangled, I decided he needed a pouch to hold them. The one thing about so many ear bud tutorialspatterns is that they are not designed with kids in mind. They are too small for tiny fingers to manipulate stuffing dangling cords into, kids will either never zip up the pouch or will ‘cut into’ the ear bud wires trying close it, and many of those pouches are designed to fit ear bud cords that have been wrapped around themselves (to keep them neat an untangled) – which kids will never do (my teenager doesn’t do this either). So, I made my own. I let Easton select two fabrics for his pouch (he picked flames and skulls), used the built in alphabet on my machine to embroider his name on the front, and attached Velcro for the closure. 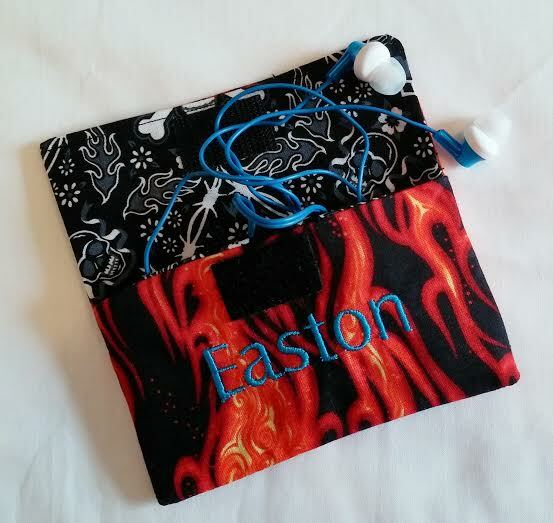 The finished size is 5 x 3″ when closed – the perfect size for ear buds that will never be wrapped and big enough for small hands to manipulate…. now let’s just hope he doesn’t lose that pouch (which is why his name is on the front!). Anyone else need a quick to whip up ear bud pouch for their kids (or even yourself)? I was thinking of creating a tutorial and putting it on the blog soon….. This entry was posted in General on August 12, 2014 by stacy. Finish those Craftsy classes. I have yet to complete one and I’d really love to recreate my favorite pair of jeans, learn to drape, etc. Devote a bit more time to taking better quality photos for the blog… because who doesn’t like pretty pictures? Redesign the website…. it’s just time for an overhaulmakeover. Write, write, write! I have lots of tutorials and articles that have been brewing in my head. It’s time to set to work and put them down on paper (er, computer). Catch up with my pattern stash. I have numerous patterns that I wanted to have sewn up this summer and never quite got to them. I have been telling myself that I would like to start designing my own pattern line for a few years now. I’d love to develop that more… or write a book. Tackle those home projects…. maybe even throw in a home dec. project (my least favorite sort of sewing) or two. I’d love to hear what’s on your list! What do you hope to accomplish over the school year? This entry was posted in General on August 11, 2014 by stacy. I may or may not have done something crazy…. I decided to ‘audition’ for Project Run and Play season 10. 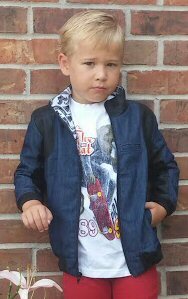 For those that aren’t familiar with the site, this blog hosts Project Runway style challenges each week to competitors who design their own clothing items for children. The garments are then judged by a panel and then voting is open up to the public. It’s a fun process to watch, but I’ve never decided to take the plunge until now…. I’m thinking that because Easton will be in school full time, I’ll have a more time for something this big. In just a few short hours, the finalists will be announced and voting will begin as to who the next competitor will be… I hope you’ll bop over there at 10 (MST) and see if you see my name and give me a vote – we’ve got to represent some boys clothes in this competition! (If you’re curious what garment I submitted, I went with the Imagine Jacket. While this isn’t my own pattern, it is a good representation of my sewing, it’s very recent, and has decent photography). This entry was posted in General on August 8, 2014 by stacy. Need a quick checkbook cover makeover? This is the tutorial for you! Could your sewing roomarea use a cutting table? Here’s how to make the greatest one of all time. Are leg warmers going to be in again this year? Every once and awhile, I get the urge to make a quilt. Since I’m not really a ‘quilter’ I just never know how to use some of the precuts – The latest pattern from Fat Quarter Shop uses a fat quarter bundle to make a gorgeous quilt (and has a video tutorial, too)! The name for this little girl’s dress tutorial is called The Paper Bag…. it looks nothing like one, it’s just simply adorable! When I was pregnant with my youngest, I invested in a GIANT body pillow that looked a lot like the one in this tutorial. If you know someone who is pregnant or are pregnant yourself, I highly recommend making one for yourself! Everyone needs a great back for traveling. This one can be worn cross-body style and has lots of wrap around pockets for storage. 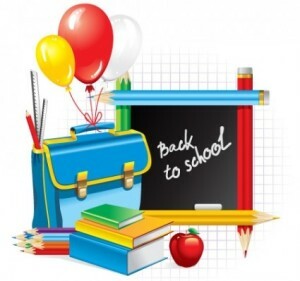 Have a student getting ready to go to college? Make them a laundry bag (with pockets for storing change for the machines) to send them off to school. PomPoms are a very trendy ‘accessory’ right now, learn how to make fruit shaped ones with this tutorial. Everyone loves easy-to-sew projects. Here’s a tutorial on how to whip up a skirt in 30 minutes. Or, spend a few extra minutes sewing an make a fun eyelet skirt that makes a great transitional piece for fall. This entry was posted in General on August 7, 2014 by stacy. Do you ever have one of those weeks where your projects never quite turn out quite as you expected? This week I had intended to sew up some new fall garments for myself, but so far, they haven’t worked for me, but fortunately, work great for my daughter. Today’s garment is Jocole’s Peplum Top. I had purchased this pattern in the last Pattern Revolution bundle sale and had intentions to pair this top up with the Skinny Pant pattern (but in black, not this print!). I used a cute polka dot print that I had purchased eons ago at Needle Nook Fabrics and set to work. The pattern itself goes together quickly, fits well, and is easy to sew. While it looks totally adorable on my daughter, it doesn’t look quite right on me… I think I would like it better in a solid color because this print just doesn’t work for me. I also don’t care where the seam hits me (this is the same issue had with the Lady Skater as well) and the polka dots just draw attention to that area. With that said, I’m not giving up on this pattern, I’ll just rethink my material choice next time. This entry was posted in General on August 6, 2014 by stacy. Continuing on my mission to “tackle the WIPs (works in progress) on my sewing table”, I decided to finally get back to the Hot Patterns Fast & Fabulous tee. This was originally a sew-along, but I got sidetracked by deadlines and never finished…. 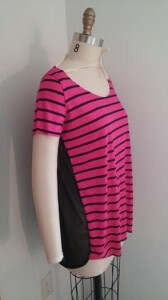 For this top, I selected a pink and navy stripe jersey (from Hancock Fabrics) and used the Tricot Mesh from Gorgeous Fabrics (the same mesh that I used for this Comino Top) for the backside. So far, things have gone together well, but…… I test fitted this shirt and stopped – it’s just not me. I have come to realize that while blousy style tops look great on a lot of people, they look weird on me (even my daughter agrees). With that said, this style is totally my daughter. 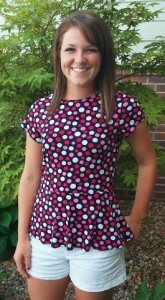 She tried it on and liked it (yeah, another first week of school garment), but with a few modifications to the hem. So, I’ll be eventually finishing this one up just for her and will work on more fitted garments the next time around. This entry was posted in General on August 5, 2014 by stacy. I know what you’re thinking: “This is a pretty boring shirt”. However, I felt the need to share it because it’s been sitting in an ‘unfinished’ pile for over 6 months waiting for hems. I had originally started this project back in February to go with the cute leopard leggings I had made and became disenchanted with it after having to rework the neckline (I tried to lighten the photo some so you could see it better, but it just doesn’t work with black well, does it?). With summer coming to a close, I thought it was time to finally tackle all those projects waiting for me to finish. I’m happy that I did this one too, because the material on this shirt is butter soft so it’s comfy to wear and it’s a very nice length as well…. I still hate the pattern though. This entry was posted in General on August 4, 2014 by stacy.